The Governor of St Helena, Ascension and Tristan da Cunha is based in Jamestown, St Helena, with a Resident Administrator handling government matters on Tristan. Tristan da Cunha is part of the UK Overseas Territory now known as St Helena, Ascension and Tristan da Cunha: one of the remaining former colonies which have not yet asked for independence, and wish specifically to retain their link with the United Kingdom. Britain, through the Territory's Governor (appointed by and representing HM The Queen), retains responsibility for external relations, internal security, defence and the Tristan public service. The Governor, who resides on St Helena, appoints a Tristan da Cunha Administrator to represent him on Tristan. HE Lisa Phillips became Lisa Honan when she married St Helena Detective Inspector Dave Honan in a ceremony on St Helena on 24th February 2018. We extend congratulations to the couple for a long and happy life together. HE Lisa Phillips addressing the large crowd in Jamestown during the ceremony. Sean Burns is seated far right and UK Foreign and Commonwealth Office Representative Alex Cameron, seated immediate right of the Governor. Left: Arriving for the official swearing-in-ceremony. The RMS St Helena arrived in James’ Bay this morning, bringing with her the new Governor Designate for St Helena, Ascension Island and Tristan da Cunha - Ms Lisa Phillips. Ms Phillips is the 68th Governor of St Helena and her Dependencies and the first ever female to take on the role. She was sworn in this afternoon, just after 2pm, Monday 25 April 2016. Thank you so much for your warm welcome. And I would like to pay tribute to Sean Burns who has been so ably performing the Acting Governor role while I have been on my way. I am so pleased to be here. I found out I had been successful for this job last summer and have been itching to get here ever since. I have to say it is such an Honour to assume this responsibility and swear the Oath of Allegiance to Her Majesty the Queen as Her Governor of St Helena, Ascension and Tristan da Cunha. I also count myself very lucky indeed to have visited Tristan da Cunha on my way to St Helena. Such a remarkable place with remarkable people. I think Tristan will hold a special place in my heart from now on and I want to thank the community there for such a fantastic welcome and for the terrific staff of the RMS for getting me there, against all the odds. Even though I am based on St Helena, I am committed to performing my Governor role well in each Territory, including Tristan and Ascension. 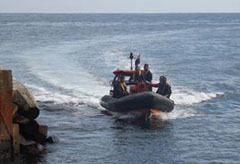 The Island Council on Tristan da Cunha and the Ascension Island Government have a difficult job, trying to build revenues in order to provide more and better public services. I want to support them to do that. Thank you for your warm welcome to St Helena. The Governor and I have been travelling for nearly two weeks now, mingling with the passengers and crew of the magnificent RMS. I will, like many here, mourn the departure of this outstanding vessel when she’s taken out of service later this year. She’s been the lifeline to the Island for many years. I’m sure most assembled here have at one time or another travelled on her. She is your family when onboard, an extension of the Island, and a symbol of the community. It is poignant to reflect that Lisa Phillips has become the 68th, and final, Governor to have arrived on St Helena by ship. But the past gives way to the future. Last week, an international jet landed on this Island for the first time. And so this Island is not just looking towards the future. It is living in the future. And we shouldn't forget that Lisa is Governor not just of St Helena, but of Tristan Da Cunha, and Ascension too. These are three of the most beautiful places on earth. They represent our rich history and our shared bonds. They’re inhabited by some of the most resilient people on earth, tied to the UK in a unique way. They harbour magnificent environments, being home to one third of the UK’s endemic species. Lisa has promised to be an active Governor across all her patch. She was visibly moved by her recent visit to Tristan and has told me how much she is looking forward to visiting Ascension. 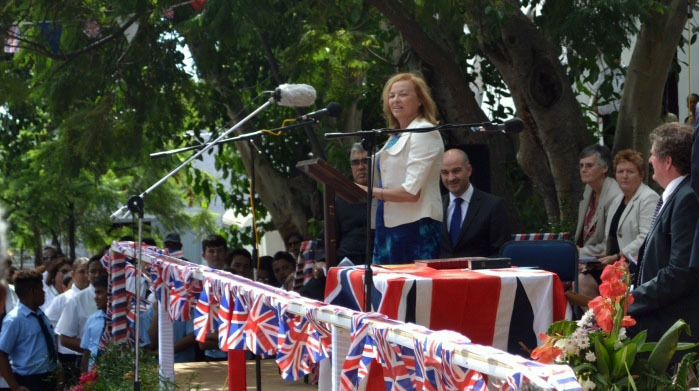 The UK Foreign and Commonwealth Office announced on 20th January 2016 that Lisa Phillips has been appointed Governor of St Helena, Ascension and Tristan da Cunha. The Tristan da Cunha community are delighted that Lisa will join the RMS St Helena on its final passage to Tristan da Cunha, departing Cape Town on 14th April, arriving at Tristan to lead the island's bicentenary celebrations on 20th April, and departing Tristan on 22nd April to then arrive on St Helena to formally take up her post of Governor on 26th April. 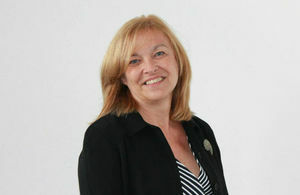 Lisa is presently working for DFID (Department For International Development) as Head of the Kenya Office. She has a long and distinguished service with FCO, DFID and the ODA. Before 1984 she worked for the ODA, in South Africa, Namibia, Botswana, Lesotho, Swaziland, as Programme Manager, and in the Personnel Sections. Further ODA contracts between 1998 - 1996 took Lisa to Barbados, where she was Programme Manager, to India where she was Programme Manager for the Country Team, and to South East Asia, where she was Programme manager in Sri Lanka and Indonesia. Between 1996 and 2002 Lisa worked for DFID as Resources Manager, Aid Policy Department and EU & Regional Policy Manager, Eastern Europe & Central Asia Department. There followed a two year UNICEF appointment as Commonwealth Programme Manager, UN & Commonwealth Department between 2002-2004. Between 2004-2008 Lisa returned to work for DFID as Deputy Team Leader (Followed by Team Leader) - Fragile States, Policy Division, in the Fragile States Team and Migration Team Leader, Migration Team, Policy & Research Division. From 2006-2009 Lisa was Returns Reintegration Fund Manager, in the FCO Migration Directorate. Since 2011 Lisa has worked for DFID in a range of senior posts: Head of Cabinet, Policy & Research Directorate (2009-2011); Head of Department, Governance & Fragile States Department (2011-2012); Anti corruption lead in the Policy Division (2012); Head of Director’s Cabinet, Policy Division (2012-13); Head of the Kenya Office (2013 - 2016). Governor Mark Capes will return to St Helena on 30th January 2016, following overseas business and leave, and will depart the Island on Friday 18 March 2016 to carry out official business in Paris and Corsica connected with the Napoleonic bicentenary celebrations. From 18th March, Head of the Governor’s Office, and former Tristan Administrator Sean Burns, will again become Acting Governor until Lisa Phillips arrives at St Helena on the RMS on Tuesday 26 April 2016. 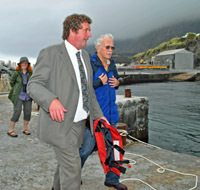 Sean Burns then returns to Tristan da Cunha to serve a second term as Administrator. 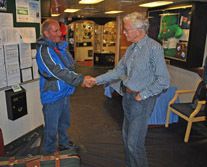 Photos from Shirley Squibb show the RMS St Helena off Tristan on 19th November, HE Mark Capes entering Calshot Harbour on the Tristan Police RIB and being welcomed by Tristan Island Councillor Gerald Repetto with Administrator Alex Mitham looking on. 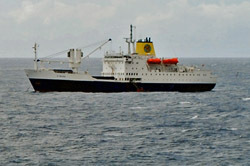 For a full report on the RMS St Helena Visit go to the separate RMS St Helena 2013 Voyage Page. I have waited almost exactly 2 years as Governor to get here but it has been well worth it. I am very pleased to be with you at last to see for myself all that I have heard so much about. That’s very important because having seen Tristan for myself I can argue more convincingly to support Tristan’s case for any support it may need from the UK Government or indeed from elsewhere. That said, your previous Administrator Sean Burns was an excellent and energetic advocate for Tristan and achieved much in his three years here while also dealing with weighty and unexpected problems such as the MV Oliva incident. I am sure that Alex Mitham will be just as enthusiastic and effective. Alex brings to the job a most valuable and diverse package of skills and experience. Today Tristan has much to be rightly proud of. You have a fine, caring and safe community. A community where the phrase ‘love thy neighbour as thyself’ takes on a very real meaning. 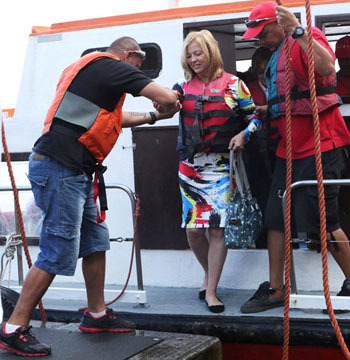 In recent years you have demonstrated careful and responsible management of the island’s finances, a process that called for some tough decisions. This sends a clear message that you are serious about wanting, as far as possible, to manage your own affairs. In aiming to achieve that you will have the full support of the Administrator and me. Responsible financial management strengthens your arm when making the case for assistance with costly capital projects that are quite clearly beyond the reasonable means of the island to finance. So I warmly congratulate the Tristan Council, the CEO and government officials for not being afraid to take the hard but absolutely correct decisions. After living on small islands for 14 years I know how it can be really tough to make the right decisions and to take the criticism from those in the community that don’t or perhaps won’t understand the reasons. Let us not forget that the UK has been struggling through one of the worst economic recessions for decades and there is some way to go before we are out of the woods. For some time now the message from London to UK government departments has been to find efficiency savings and to do more with less. Against that tough backdrop you have a stronger voice in London because of the careful and responsible way that you have managed your financial position. Well done again to all concerned for a strong performance and I urge you to keep to that path. We know that Tristan has many good friends around the world – a good number of them are here in this hall tonight. They are fascinated by your history, by your success, your resilience, your kindness and by the warm welcome that you extend to your visitors. But I think it is also your love for your island home that they admire. Perhaps that thought is particularly relevant given that this is the 50 th anniversary of the return to Tristan in 1963. That difficult episode tested the community. I expect there are still questions asked about what lasting impact that enforced absence from Tristan, your home, can be seen in the community today. But what is glaringly obvious to me is that the love Tristanians have for their island is today as strong as ever. Out of the hardship that you, as an entire community successfully endured some 50 years ago, you have emerged stronger. Because of it you can better understand the suffering of others who are tested by disasters, such as we have seen recently in the Philippines. It is much to your credit that you have contributed generously to help our brothers and sisters in the Philippines in their time of need. So for me it is a privilege and indeed an honour to serve as your Governor. In concluding these brief remarks, I am thrilled to be here on Tristan and I thank you for your warm welcome. 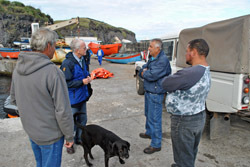 Mr Sean Burns, presently serving as the Administrator on Tristan da Cunha, has been appointed as the next Head of the Governor's Office and will take up the position in January 2014. The role has been upgraded and will carry additional responsibilities, including that of acting as Acting Governor in the Governor's absence, a change that follows the model used in the Falklands. We look forward to reporting on Mark's first visit to Tristan. 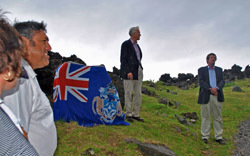 Before then we will be introducing a new Tristan da Cunha Administrator and whilst it will be very good that the new Administrator will be able to greet the Governor so early in his sojourn, it is regrettable that Mark Capes has not visited Tristan during Sean Burns' administration. Sean added that he knew Mark and his wife Tamara are both keen to visit Tristan as soon as they can but the logistics are challenging and a number of options are being considered. My wife, Tamara and I are thrilled to be to here with you today. We thank you for the warm welcome and also thank all those who organised and participated in this excellent ceremony. It is indeed a great honour to be appointed to serve as Governor of St Helena, Ascension and Tristan da Cunha; it also carries a weighty responsibility. In the months and years ahead I look forward to drawing upon all the skills I have gained over many years as a member of Her Majesty’s Diplomatic Service working in many countries including 12 years in three other Overseas Territories. When I saw the opportunity to serve as Governor here I jumped at it because I saw it as ideally suited to my experience. It is also fair to say that I had also heard much about the beauty of St Helena, the charm of its people and of course of its intriguing history. In carrying out my duties as Governor I give you my assurance that I will seek to be accessible and as transparent and open as possible about government policies and decisions, while fully embracing a spirit of partnership and cooperation with your elected representatives and of course with you, the good people of St Helena, Ascension Island and Tristan da Cunha. To achieve that I must first get to know you and understand your concerns and your hopes; so I will look forward to engaging closely with you as we settle in to become part of your community. That said we have enjoyed already a marvellous introduction to St Helena by travelling for the last two weeks on the splendid RMS St Helena which I heard some passengers fondly describe as a little piece of St Helena. During that trip we saw the great professionalism of the ship’s crew, experienced their kindness and good humour and in talking to Saints, both passengers and crew, understood the strength of their affection for St Helena, their home. Tamara and I extend our grateful thanks to Captain Greentree and his superb crew for a truly memorable experience. A moment ago I was sworn in as the Governor OF St Helena, Ascension Island and Tristan da Cunha. But to my mind I think I see my role more as the Governor FOR St Helena, Ascension and Tristan. 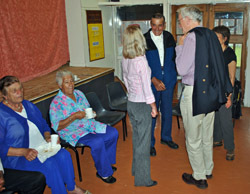 It is true of course that, as with all Governors, I have several distinct roles – among them to serve as Her Majesty’s representative; to represent the interests of the UK Government; and to fairly and fully represent the interests of the people of St Helena, Ascension and Tristan to Her Majesty’s Government in the UK. You could quite reasonably argue that in fulfilling those roles from time to time there may be some conflicting interests to manage. But I am pleased to be able to say to you, and with every confidence, that the British Government we have today is one that holds a powerful and genuine sense of commitment to the Overseas Territories. In London just a few weeks ago I had meetings with the Foreign Secretary, with the Secretary of State for International Development and with other senior Ministers. We met to discuss my priorities on taking up this appointment. I left those meetings feeling greatly encouraged, confident in the knowledge that Ministers in London are fully engaged and keenly interested to ensure that the islands for which I now have responsibility as Governor should have the opportunity to enjoy a secure and prosperous future. We have now the firm foundation for a mutually beneficial working relationship with the UK Government and we must build on that. This modern working relationship means that the very substantial financial input from the UK tax payer requires commitment from St Helena on various fronts. In keeping with that I know that a great deal of truly impressive work has already taken place here to meet the terms of the Memorandum of Understanding. It is because of the strength of commitment from the UK Government and the equal commitment shown from here to working towards a sustainable future that I think Governor FOR St Helena, Ascension and Tristan fits better with the role that I see ahead. 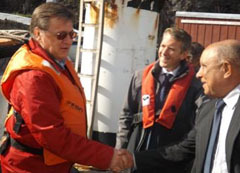 Tamara and I thank you again for this impressive and warm welcome to your very special island home. Thank you. Governor Andrew Gurr has announced that his successor will be Mark Capes. Mark will arrive to become Governor of the UK Overseas Territory of St Helena, Ascension and Tristan da Cunha in late October following Andrew Gurr’s departure on 23rd September. 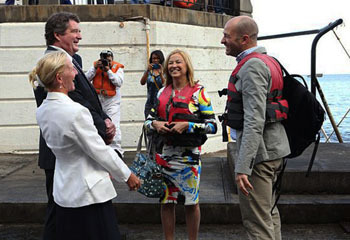 Mark is a member of Her Majesty’s Diplomatic Service and will be accompanied by his wife Tamara. He is presently Chief Executive Officer of the Turks and Caicos Islands Government and previously held the position of Deputy Governor in both Bermuda and Anguilla. His Foreign and Commonwealth Office career has also taken him to Portugal, Jordan, Yugoslavia, Nigeria, Austria and New Zealand. Mark enjoys spending time with his family and has two daughters, Alexandra, who works in London, and Sarah, who will shortly begin a second Master’s degree course in London. His leisure interests include sea and fresh water fishing as well as enjoying music ‘from Bob Marley to Mozart’. His wife is a keen tennis player and also enjoys reading and working as a volunteer for the Society for the Prevention of Cruelty to Animals. 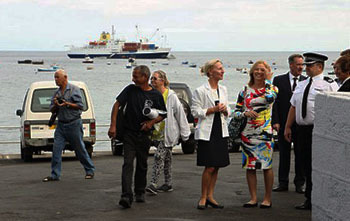 We look forward to hearing of Governor Capes’ plans to visit Tristan da Cunha and hope he can facilitate a return to a regular RMS St Helena voyage to Tristan to achieve this following the highly successful 2006 and 2011 cruises. 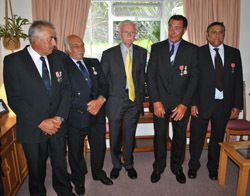 His Excellency Governor Gurr departed St Helena aboard the RMS on 18th January 2011. 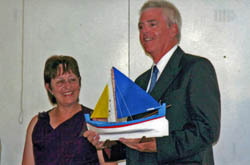 The last visit by a Governor was by Mike Clancy in February 2006. The Governor and Mrs Gurr hosted a reception on the RMS in Cape Town for those in South Africa who are interested in St Helena or Tristan. Unfortunately Mrs. Gurr will not be able to continue from Cape Town to Tristan as she will be returning to the UK for a family funeral. “I am really looking forward to visiting an island that must be on all island lovers’ list of places to see. Over the past three years I have been disappointed three times as advanced plans to get to Tristan have fallen through. Now at last I will be able to see the place and meet the people that I have heard so much about. Hopefully Tristan da Cunha will not have to wait another five years for the next visit of either the RMS St Helena or The Governor. 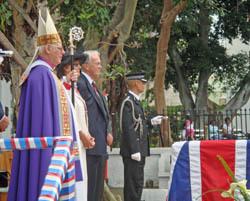 The new Governor of St Helena and its dependencies of Tristan da Cunha and Ascension Island Andrew Gurr with his wife Jean attending a ceremony in Jamestown St Helena on Sunday 11th November 2007 at which he gave his inaugural address. We publish below extracts from Andrew's CV and also provide the full text of his inaugural speech on this important occasion for the South Atlantic islands. Mr Andrew Gurr has been appointed Governor of St Helena in succession to Mr Michael Clancy. Mr Gurr is married with two children, and took up his new appointment in November 2007.